West Side 5, an award-winning vocal jazz ensemble based in New York City, is known for its refined sound and sophisticated approach to jazz. Inspired by greats like Manhattan Transfer, New York Voices, and The Real Group, WS5 has crafted its own unique sound, characterized by highly original arrangements, complex harmonies, and outstanding musicianship. The group formed in the summer of 2009, bringing together five old college friends on the west side of Manhattan. They immediately garnered acclaim, winning the Mid-Atlantic Harmony Sweepstakes while being voted Audience Favorite and winning Best Arrangement for "Pure Imagination". They went on to be featured artists at the SingStrong A Cappella Festival, and have performed alongside groups including Blue Jupiter, Streetcorner Symphony, and The Bobs, as well as for Mayor Michael Bloomberg at Gracie Mansion in New York. 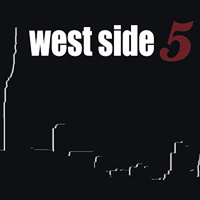 West Side Five is a New York City-based vocal jazz mixed voice quintet (3 men, 2 women), with Real Group, Manhattan Transfer and New York Voices influences. They perform original interpretations of jazz, pop and bossa nova standards at venues in the New York/New Jersey area. They also recently appeared at the Mid-Atlantic Harmony Sweeps Regional in Washington, DC, and won first place and a trip to the 2010 Sweeps Finals in San Rafael! 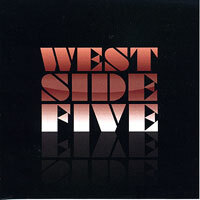 "West Side Five" is a four song Sampler CD, featuring "Pure Imagination," "Lullaby of Birdland," the Real Group-arranged "Thousand Things," and "Lil' Darlin'." We were treated to all but "Lullaby" in their excellent set at the Finals, and John Shumway's spectacular faux trumpet solo onÊ"Lil' Darlin'" drew a huge ovation! The Five have a smooth, richly harmonic sound that compares with many of the elite vocal jazz groups, and we loved their live show. These four selections had us tapping our feet and wanting to hear more! We loved New York City's own 3 men, 2 women Vocal Jazz quintet West Side 5 at the 2010 Harmony Sweeps Finals in San Rafael, their first self-titled EP album, and "West Side 5," this remarkable 12-cut debut CD! The 5 have the kind of sophisticated, buttery jazz harmonies, sweet original arrangements of jazz, pop, show tunes and bossa nova songs and some of the best faux horns we've heard. Some favorites are Billy Strayhorn's "Take the A Train," the Disney standard "Someday My Prince Will Come," Sammy Cahn's "Call Me Irresponsible" and "I Fall In Love Too Easily;" George Shearing's "Lullabye of Birdland," Jones/Schmidt's poignant "Try to Remember," Hupfeld's "As Time Goes By," Tim Eller's bright, scattish "Self-Absorbed, and Newley/Bricusse's "Pure Imagination." "If they can make it there, they'll make it anywhere" is absolutely true, and Lara, Sara, John, Eric & Steven are commonly compared to such elite groups as the Real Group and New York Voices. Great jazz, album and group, don't miss this one!